Chris Scott press conf (R4) Chris Scott speaks to media ahead of Geelong's round four match against GWS. 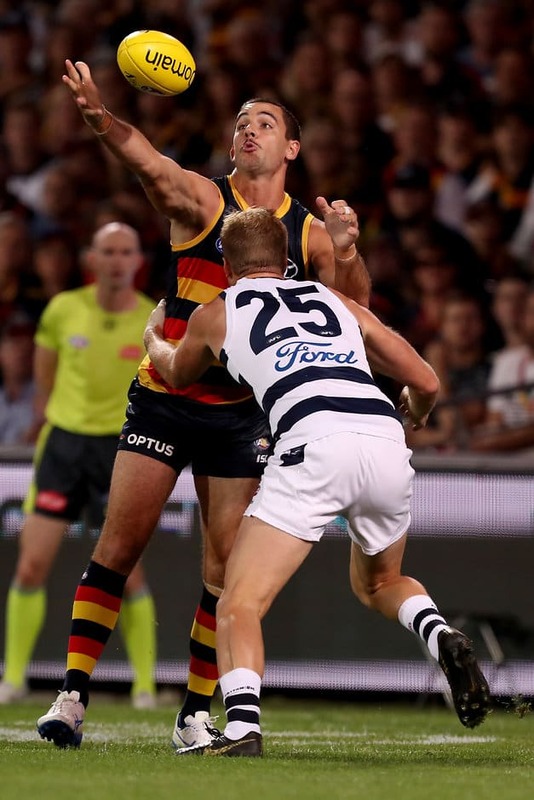 GEELONG will be forced to make at least one change for Saturday's clash against Greater Western Sydney, with defender Lachie Henderson ruled out for up to three weeks with a plantar fascia injury in his foot. However, Cats coach Chris Scott is "very confident" star midfielder Tim Kelly will be available to play despite hurting his ankle against the Crows last Thursday night. Defender Mark O'Connor should also be fit to take his place despite a heavily corked hip, while Jack Henry (hamstring) has been cleared to play. Scott said fellow backman Zach Tuohy could be available to play next week after a long-term knee injury, which required two lots of surgery, although given the football he is missed it could be through the VFL. Scott said Henderson would be sidelined for 2-3 weeks with the foot injury. "It's unfortunate for Lachie and for us because he'd been in good form in the VFL, found his way into the team and played well for us," Scott said on Wednesday. "But discretion is the better part of valour with this one. He's going to be important to us later on in the year. "And particularly with those injuries, even if it's possible to play with them, they can tend to drag on. We had that experience with Harry Taylor last year, so we're going to be conservative with that one." Henry is right in the frame to be a direct swap for Henderson, having missed the game against the Crows because of a hamstring strain. "That'd be logical thinking, but we haven't made that decision yet," Scott said. "We need to be absolutely sure that Jack's right. "As I alluded to last week, the decision to take Jack out was more around the five-day break than the severity of the injury, so we're really confident he'll be right." Midfielder Cameron Guthrie is available to play after overcoming a calf problem that has kept him out for the first three rounds, although there's still a decision to be made whether he plays in the AFL or VFL. "He's had a really good week on the track so he's an absolute possibility to come straight back into the team, given the amount of training he's had," Scott said. Scott said fellow backman Zach Tuohy could be available to play next week after a long-term knee injury, which required two lots of surgery, although given the football he has missed it could be through the VFL. "(He's) touch and go to play some footy this week, but more likely we'll hold him back until next week," Scott said. Jed Bews (groin) is a fortnight away from a return, while Scott Selwood (hamstring) is being held back to ensure there's no recurrence of a soft tissue problem.